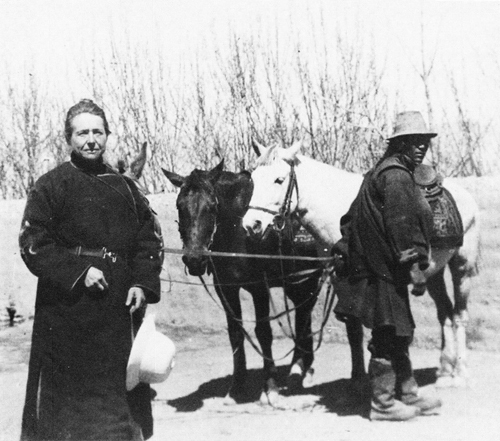 Today is the birthday (1868) of Alexandra David-Néel , first foreign woman explorer of Tibet. She was also a spiritualist, Buddhist, anarchist and writer. She is most known for her 1924 visit to Lhasa in Tibet when it was forbidden to foreigners. David-Néel wrote over 30 books about Eastern religion, philosophy, and her travels. Her teachings influenced beat writers Jack Kerouac and Allen Ginsberg, philosopher Alan Watts, and esotericist Benjamin Creme. She was born in Saint-Mandé, Val-de-Marne, and moved to Ixelles in Brussels with her family at the age of six. During her childhood she had a very strong desire for freedom and spirituality. At the age of 18, she had already visited England, Switzerland and Spain on her own, and she was studying in Madame Blavatsky’s Theosophical Society. She joined various secret societies – she would reach the thirtieth degree in the mixed Scottish Rite of Freemasonry – and played major roles in feminist and anarchist groups. In 1899, she composed an anarchist treatise with a preface by the French geographer and anarchist Elisée Reclus. Publishers did not dare to publish the book, though her friend Jean Haustont printed copies himself and it was eventually translated into five languages. In 1890 and 1891, she traveled through India, returning only when she was running out of money. From 1895 to 1897 she was prima donna with a touring French opera company in Indochina, appearing at the Hanoi Opera House and elsewhere in La Traviata and Carmen. In Tunis in 1900 she met and lived with the railroad engineer Philippe Néel, marrying him in 1904. 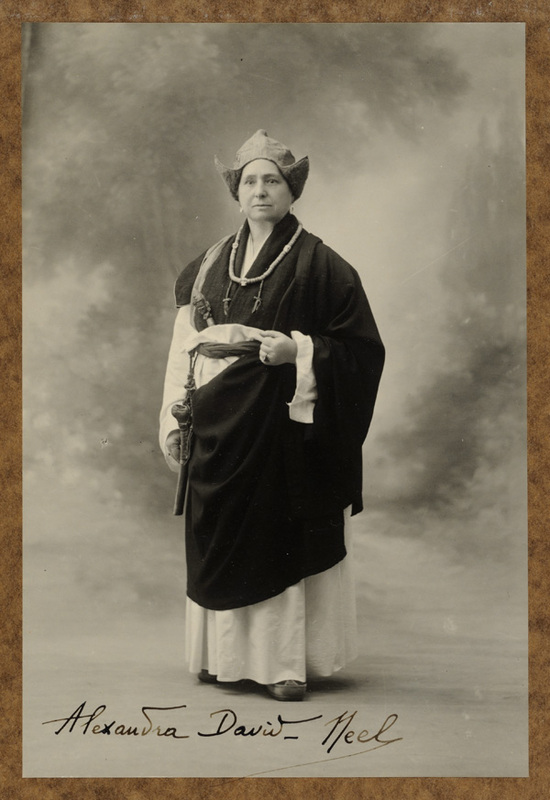 In 1911 she left Néel and traveled for the second time to India, to continue her study of Buddhism. She was invited to the royal monastery of Sikkim, where she met Maharaj Kumar (crown prince) Sidkeong Tulku Namgyal. She became Sidkeong’s “confidante and spiritual sister” (according to Ruth Middleton), perhaps his lover. 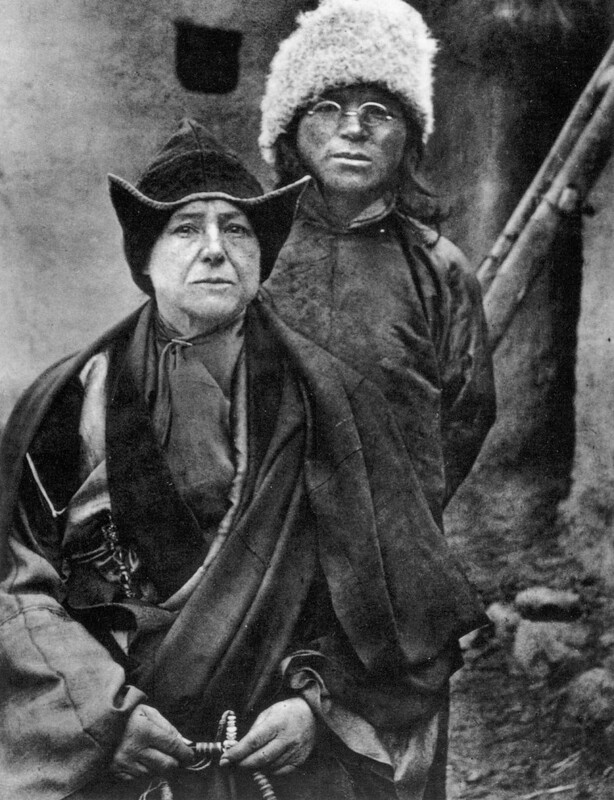 She also met the 13th Dalai Lama twice in 1912, and had the opportunity to ask him many questions about Buddhism – a feat unprecedented for a European woman at that time. In the period 1914–1916 she lived in a cave in Sikkim, near the Tibetan border, learning spirituality, together with the young (born 1899) Sikkimese monk Aphur Yongden, who became her lifelong traveling companion, and whom she would later adopt. From there they trespassed into Tibetan territory, meeting the Panchen Lama in Shigatse (August 1916). Sikkim was then a British protectorate and when the British authorities became aware of their presence Alexandra and Aphur were forced to leave the country. 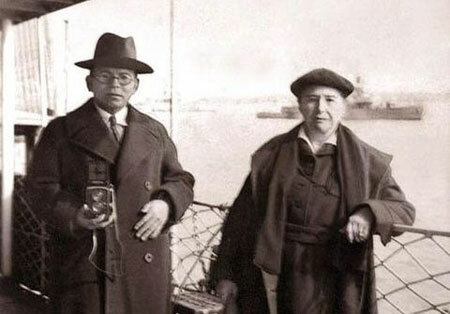 Unable to return to Europe in the middle of World War I, David-Néel and Yongden traveled to Japan. In Japan she met Ekai Kawaguchi, who had visited Lhasa in 1901 disguised as a Chinese doctor, and this inspired them to visit Lhasa disguised as pilgrims. After traversing China from east to west, they reached Lhasa in 1924, and spent two months there. In 1928 Alexandra legally separated from Néel, but they continued to exchange letters and he kept supporting her until his death in 1941. She settled in Digne (Provence), and during the next nine years she wrote books about her experience and philosophy. In 1929, she published her most famous and beloved work, Mystiques et Magiciens du Tibet (Magic and Mystery in Tibet). In 1937, Yongden and Alexandra went to Tibet through the then Soviet Union, traveling there during the second World War. They eventually ended up in Tachienlu, where she continued her investigations of Tibetan sacred literature. David-Neel evidently remained in Tachienlu for the duration of the war. 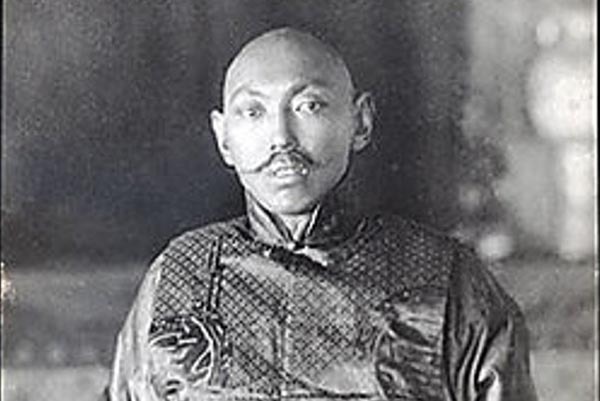 While in Eastern Tibet Alexandra and Yongden completed circumambulation of the holy mountain Amnye Machen. The pair returned to France in 1946. Alexandra was then 78 years old. In 1955 Yongden died at age 56. She continued to study and write at Digne-les-Bains until her death there at the age of nearly 101. According to her last will and testament, her ashes and those of Yongden were mixed together and dispersed in the Ganges in 1973 at Varanasi, by her friend Marie-Madeleine Peyronnet. Tibetan dishes have become available in restaurants in the West in recent years. When I lived in New York I was a regular visitor to the Himalayan Yak in Jackson Heights in Queens, specializing in Tibetan and Nepalese foods. Unless you have a steady supply of yak butter and yak cheese I’d suggest leaving preparation of these dishes to the locals. Tsampa is the staple food of Tibet. It is made by dry frying barley grains then grinding them into flour. Butter tea and water are added to form a stiff dough which is then kneaded thoroughly until it can be pinched into pellets. Tsampa is easy to carry, suitable for the pasturing life. When Tibetans go out to tend herds they take a wooden bowl with a “tanggu” (a bag to carry Tsampa) strapped on their waists and a little tea. You can also add some meat and vegetables to tsampa and make it into a barley porridge called tuba in Tibetan. On New Year’s Day in the Tibetan calendar, Tibetan families put out an auspicious wooden bucket named zusuokima on a table filled with tsampa and decorated with moon and star designs, and maybe whole barley ears. When neighbors or relatives visit, the host will present the “zusuokima” and the visitors will pick up a little tsampa and throw it into the air three times, and then pick up a little and eat it saying “tashi delek” (“everything goes well”) as a blessing.